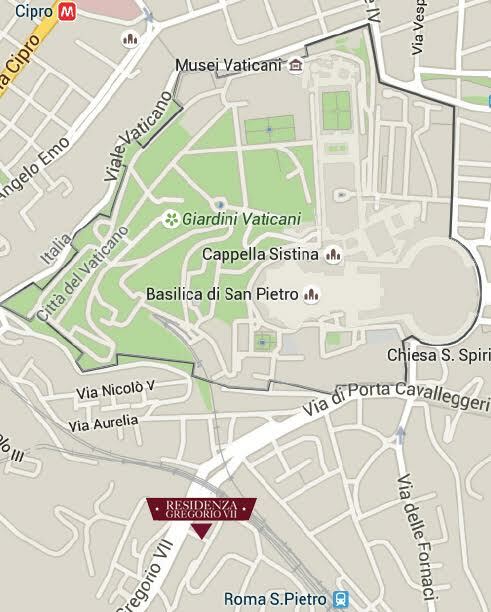 The Residenza Gregorio VII is an elegant Guest House situated 5 minutes walk from St. Peter's Basilica. It has ben completely renovated in 2014 in contemporary style. It is located on the ground floor and on the first floor of the building and it’s provided of a paved garden where our guests can sit and relax, surrounded by greenery and scents of jasmine and bougainvillea. The Guest House has six bedrooms, each with private bathroom, free WiFi, TV SKY Vision Plus, air conditioning, fridge, safety box, electric shutters.